Life has been SO busy lately. If we’re Facebook friends you probably know about my husband’s cycling accident, 6 weeks ago. He crashed on a slippery road coming downhill, and broke his hip and wrist. His hip was operated on the next day to pin it, and the day after that he was on his feet on crutches. He’s making a good recovery, though still has to use the crutches for a few weeks yet. So I am having to do a lot extra in the home – all the cooking and cleaning instead of sharing it, all the driving around, shopping, taking him indoors to physio appointments etc. The day job has been manic lately. I won’t bore you with the details but I’m definitely being pulled every which way and then some. Could do with cloning myself to get it all done. I’m over the moon at having a two book deal – it’s what I’ve worked towards for ten years. But with contracts come deadlines, and the pressure’s on to get book 1 revised and back to my editor, also to get the first draft of book 2 completed. Both are on target, just about. With the pier-to-pier swim completed that means no need for swimming training, but him indoors has discovered that a short swim in the sea is really helping his recovery. He hobbles in on crutches, then I take the crutches and leave them on the beach, then swim with him, then help him out of the water at the end. On beautiful Bournemouth beach and in weather like we’ve had, this is no hardship so I’m not complaining. But it’s all time out of my busy day. Earlier this year I signed up for the Bournemouth half-marathon, which is in early October. So I need to pick up my running – get out there and start building up the distance. I’m so slow a 10km run takes me nearly an hour and a half. And then today I realised that I have to do the ‘blue’ jobs as well as the ‘pink’ jobs. A U-bend under the in-sink disposal unit (aka the muncher) clogged up. I have never, repeat never, unblocked a U-bend in my life before today. (I have led a sheltered life and there has always been someone around with greater plumbing skills than me.) But I managed it, and then did a silly dance around the house because it is now official – I AM SUPERWOMAN and I can do ANYTHING! Ahem. All this is really just a long-winded excuse for the lack of blog posts lately. Pier to pier swim completed! I swam the Bournemouth Pier to Pier swim this morning – 1.4 miles in open water, the sun sometimes shining, the sea pretty calm but not completely flat. I surprised myself by really enjoying it! 900 people started with me, and another 1100 were starting two hours later. That’s a huge number to run into the sea all at once. I hung back, knowing I’d be one of the slower ones. I’d buddied up with a friend of a friend who was also expecting to be slow, and we stuck together for the whole swim. There are 11 groynes to pass, and I counted each one as we swam past the end. The first 3 took ages, then suddenly we were half way, then by the time we got to groyne 10 I felt I could go on forever. But was still thankful to stagger out of the water beside Boscombe pier. My finishing time was around one hour – but it was about the taking part and the sponsorship more than the timings. The fastest people did it in around 30 minutes, but there were still some stragglers coming in after 90 minutes. Would I do it again? Very possibly, yes. My husband wants to do it – having missed out this year due to his broken hip and wrist, from a cycling accident. So I’ll do it again with him. As long as it doesn’t clash with the RNA conference which I have promised myself I’ll go to next year! No photos, sorry. Was too busy swimming. I did see one swimmer with a camera attached to her head and another on her back. Looked a bit odd. You can see a few photos and a write up over at the Bournemouth Echo website. Next weekend I am entering the Bournemouth pier to pier swim. This is approximately 1.4 miles of open water swimming, and yes, I’ll be wearing a wetsuit. I’m raising money for Macmillan cancer support with this swim. I chose them because a friend and work colleague died last week, and I know this charity meant a lot to him, so it seemed a fitting way to remember him. Not entirely sure he was much of a swimmer himself, however! I’d love it if you could sponsor me – every little helps, and this is a very worthy charity. I know that many of my blog readers will have been touched by cancer in one way or another. 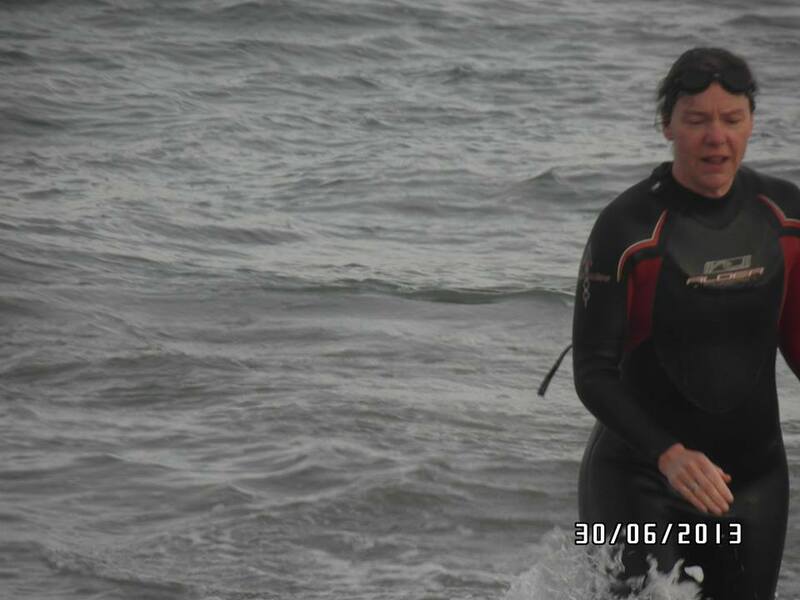 Here’s the link to my JustGiving page https://www.justgiving.com/Kathleen-McGurl/ and here’s a gratuitous photo of me looking hideous in a wetsuit.